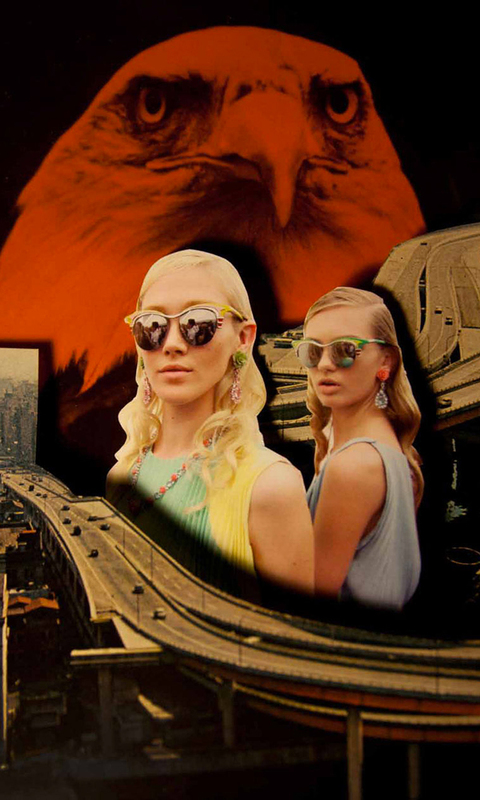 Prada presents her collection “Prada Spring Fantasy 2012” over bonding, overlays and vintage inspirations. An aesthetic success! Exploring the nostalgia of hot rodding, golfing, picnicking, the space race, and other wholesome past times. Told through a sequence of 100% handmade collages – continuing the new trend of hancraftsmanship started last season.The real fantasies is a palimpsest of photography that pulls the reader into a realm of hyper reality. And serves as perfect backdrop for Miuccia’s 50’s americana inspired collection. The innovative campaign is shot by Phil Meech and artworks are done by Jereon Koolhaas and Lok Jansen. The latter two had fun with collages, overlays and fonts for an effect, retro homage can be seen in the artworks. And just because Prada does things well, there is also a video by James Lima performed on the same graphics.